With the Tire Mobility Kit you stay mobile even after experiencing a tire puncture. After you ensured that the tire is properly sealed you can drive cautiously on the tire (up to 120 miles (200 km)) at a max. speed of 50 mph (80 km/h) in order to reach a vehicle or tire dealer to have the tire replaced. The Tire Mobility Kit is not designed or intended as a permanent tire repair method and is to be used for one tire only. This instruction shows you step by step how to temporarily seal the puncture simply and reliably. Read the section "Notes on the safe use of the Tire Mobility Kit". Do not use the Tire Mobility Kit if a tire is severely damaged by driving while flat or with insufficient air pressure. 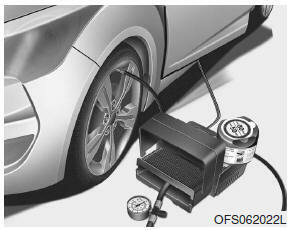 Only punctured areas located within the tread region of the tire can be sealed using the Tire Mobility Kit. Damage to the sidewall must not be repaired due to safety reasons.